The court case of Meseret Bahlbi against Mirjam van Reisen is one that is aimed at stopping legally this woman and her kinds from slandering and intimidating members of the Eritrean community in Europe who are legally and rightfully involved in organizing and serving their community. 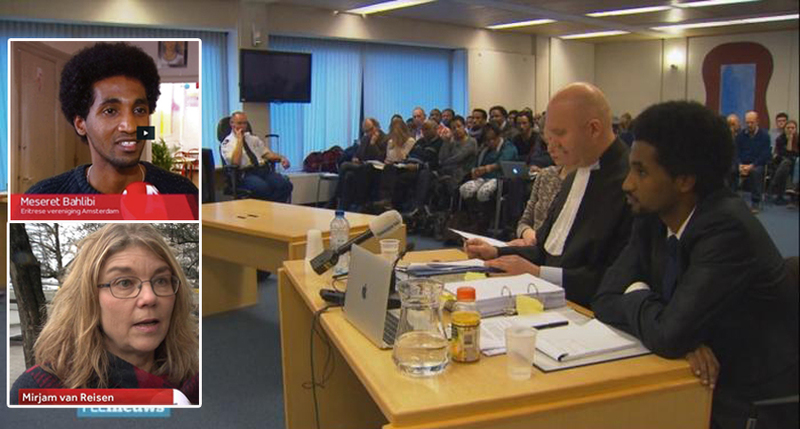 The court case of Meseret Bahlbi against Mirjam van Reisen, a Dutch University Professor, is a single significant moment for Eritreans Diaspora with the right to live without intimidation in Europe and elsewhere from influential individuals with clear political objectives. The case was brought by Meseret Bahlbi, a young Dutch-Eritrean man who grew up in the Netherlands, after his name and that of his family’s was repeatedly besmirched in the media and his reputation was tarnished in his place of work by Mirjam van Reisen and her associates. Mirjam van Reisen has made it her life-time goal to bring-about regime change in the Horn-of-Africa state of Eritrea for more than a decade. She has written extensively articles and papers with a clear aim of tarnishing the image and governance of the Eritrean government. Moreover she has raised funds and organised individuals and organisations with a clear aim of unseating the Eritrean government under the pretext of dictatorship and humanitarian causes. Using her role as a University Professor at the University of Tilburg in Netherlands, she belongs to a group of few Europeans and Americans who have waged relentless diplomatic and media war against the Eritrean government and Eritrean Diaspora who she believes are stifling her effort of regime change. Mirjam van Reisen also uses the name of an NGO called European External Policy Advisors (EEPA) she created in 2003 in which she is the only advisor listed to lobby and give credence to her papers and books she writes against Eritrea. Meseret Bahlbi and his family are an epitome of the Dutch-Eritrean Community in Netherlands who have typically lived and integrated for decades and are playing a positive role as Dutch citizens in their local community. The Eritrean community who have settled during the war for Eritrean independence in the 70s and 80s mainly, is known as a law abiding, hard working, tax paying, organised, assisting each other to settle and mutual respect. Furthermore, the community’s gender equality and harmonious coexistence of its religious and ethnic differences can only be described as exemplar community in most European and other adopted nations. The unique historical, cultural and migratory circumstances of Eritreans in Diaspora have made them to remain in close affinity and cooperation with their country of origin. Eritreans in diaspora, much like as the Israelis, are given a full citizenship rights in Eritrea and play an integral role in the development and safeguarding their birth nation against the ongoing attack from its neighbours in the thorny Horn-of-Africa neighbourhood. The majority of Eritreans in Diaspora take their duty of making Eritrea a truly developed nation seriously and remain organised to realize their objective. Ironically, it is against this backdrop in the Netherlands, that Mirjam van Reisen finds herself whipping the political condemnation of members of Eritrean community like Meseret Bahlbi, only because they have challenged her lopsided and irresponsible behaviour in her handling of Eritrean politics, which she should not have interfered in the first place. They have confronted her views and questioned her work and methods of running clandestine tactics of dividing and polarizing the Eritrean community and associating herself with unsavory characters who are known of their destabilising role in the Eritrean communities across Europe. Mirjam van Reisen approach to the Eritrean Diaspora and political meddling is unbecoming of a Dutch University Professor of International Relations. The Eritrean Diaspora expect her to remain objective in her approach and stay balanced and dedicated to assisting and developing a young African nation with huge challenges. Instead, only few weeks ago, she was at the forefront of fanatical campaign to stop the European Union cooperation with Eritrea to increase the capacity of renewable Energy and improve governance in Eritrea. The European Union went ahead and signed a five year cooperation programme and Mirjam van Reisen finds herself frustrated with her unholy objectives in tatters. One of her prime objective with her single-person organisation (EEPA) was to lobby EU to stop cooperating with Eritrea and she failed miserably and made the Eritrean Diaspora the scapegoat of her failure. The sign of her failure to convince the EU and the Eritrean Diaspora to follow her lopsided and vicious campaign has been to slander and misrepresent the principled stance taken by dutch-Eritreans who challenged her views about the Eritrean government. Mirjam van Reisen and a group of few European and American individuals like Martin Plaut have been using their influence and access to the media and diplomatic institutions to characterize the exemplary and decent Eritrean Diaspora who have challenged their views as an ‘international network of spies and thugs’. In a typical style of intimidation and silencing the Eritrean diaspora, Mirjam van Reisen and her associates have targeted principled and active individuals like Meseret Bahlbi to make an example of, by naming him as the ‘linchpin of Eritrean Intelligence Service”. The slanderous accusations is baseless to any objective observer to unravel and is meant to capitalize on the wrongful image of Eritrea created by the likes of Mirjam over the last decade in the first place. Meseret Bahlbi is a very active and visible young Dutch-Eritrean educated, professional and upstanding member of the community who is the antithesis of a ‘linchpin spy’, that, Mirjam Van Reisen has been slandering him with; moreover not satisfied dragging his name and reputation through the mud, she has also been targeting members of his family only because they did not agree with her approach and challenged her methods. Meseret Bahlbi has rightfully challenged Mirjam van Reisen legally to stop once and for all Mirjam van Reisen and her associates to slander and intimidate members of Eritrean community who are legally and rightfully involved in organising and serving their community. Mirjam has never presented any evidence to her slanderous accusation of ‘network of spies and thugs’, because it is a figment of her imagination. It does not exist, except in the wild imagination of individuals with clear political agenda against the Eritrean government. By taking this action against Mirjam van Reisen, Meseret has spoken for thousands of Eritreans in all corners of Europe who have been slandered and intimidated not to express their stance of positively engaging with programs and progress undertaken in Eritrea. He has the support of the majority of Eritreans in Netherlands and elsewhere in Europe who want to remain engaged with all the progress and development undertaken in Eritrea. Serving dutifully the Eritrean community inside and outside Eritrea is the civic right Meseret Bahlbi and thousands like him exercise daily in the pursuit of creating developed Eritrean nation, and only because this stance challenges the views and methods of Mirjam, it does not make Meseret Bahlbi a linchpin of network of spies. His actions and stance is the very antithesis of ‘linchpin spy’. We expect the Dutch Court takes an independent and unbiased decision and does not become unduly influenced by the media and social influence being exerted by Mirjam van Reisen and her University colleagues. Justice should be seen to be taking its course.